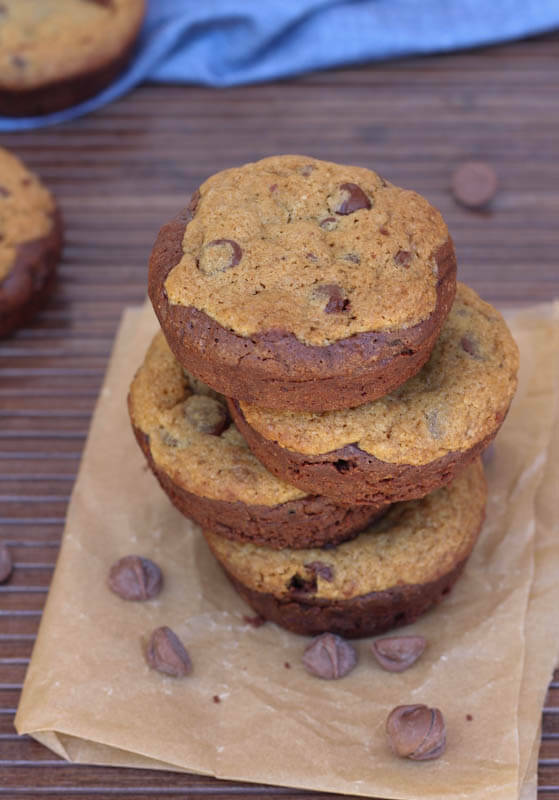 Brooksters combine everything you love about chocolate chip cookies and brownies into one delectable cookie treat that kids and adults will love! Don’t say I didn’t warn you. Because I’m warning you now. Before you read any further, these brownie/cookie tarts are addicting. I’m pretty sure I gained a few pounds over the weekend that I made them. Between scraping the cookie dough from the bowl and eating them fresh out of the oven with ice cream, these Brooksters are just as good as you might imagine. I’ve been looking forward to getting the Baked Elements book ever since it was released last fall. 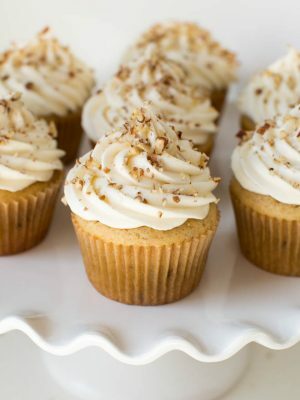 I’m always looking to try new recipes, especially when I hear rave reviews about the authors’ bakery in New York City. I love how the book focuses on ten of the their favorite ingredients. Of course, when I received the book for my birthday a few weeks ago, I flipped right to the section on chocolate. 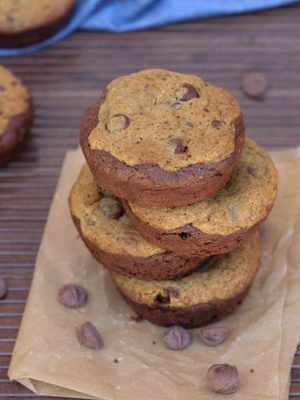 You can never go wrong with chocolate, and you certainly can’t go wrong with a dessert that is both a brownie and a chocolate chip cookie. I baked the Brooksters in an extra large muffin tin and ended up with about one dozen large cookie tarts. The recipe does require some prep time since it is absolutely necessary to let the cookie dough and brownie batter chill for the recommended amount of time. As always, I used good quality chocolate for both the cookies and brownie filling. The Brookster recipe was the first one I’ve tried from their book, and I can’t wait to try the others. 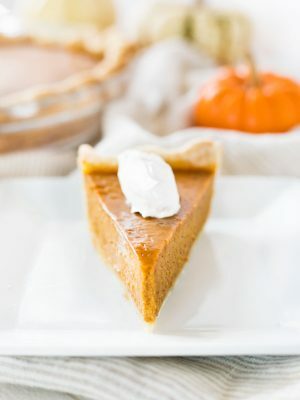 I’m especially looking forward to trying some of the pumpkin, cinnamon, and caramel recipes for the fall. 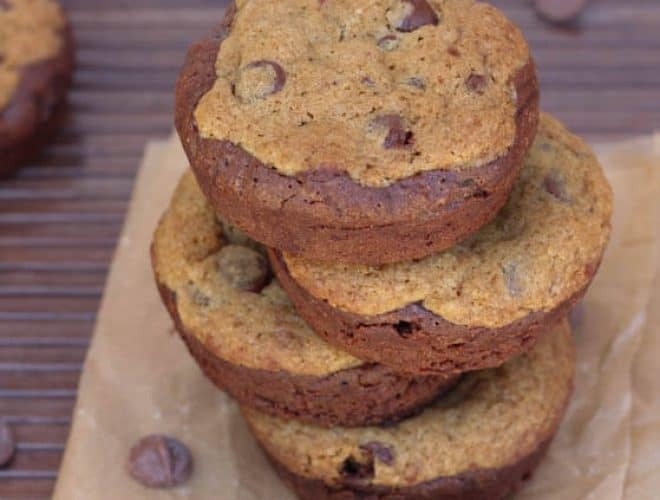 To make the chocolate chip cookie filling: In a large mixing bowl, whisk together the flour, salt, and baking soda. Set aside. In the bowl of an electric mixer fitted with the paddle attachment, beat the butter and sugars together on medium speed until smooth and creamy. Scrape down the sides of the bowl and add the eggs, one at a time, beating well after each addition. The mixture will look light and fluffy. Add the vanilla and mix until combined. Add half of the flour mixture and beat for 15 seconds. Add the remaining flour mixture and beat until just incorporated. Remove the bowl from the mixer and fold in the chocolate chips until evenly combined. Cover the bowl tightly and chill in the refrigerator for 3 hours. To make the brownie shells: Lightly butter each individual cup of a large cupcake pan. In a medium bowl, whisk together the flour, cocoa powder, and salt. Place the chocolate and the butter in the bowl of a double boiler over medium heat and stir occasionally until the chocolate and butter are completely melted and combined. Turn off the heat, but keep the bowl over the water of the double boiler and add both sugars, whisking until completely combined. Remove the bowl from the water and let the mixture cool to room temperature. Add one egg at a time to the chocolate mixture, whisking after each addition until just combined. Add the vanilla and stir until just combined. Sprinkle the flour mixture over the chocolate mixture. Using a spatula, fold the dry ingredients into the wet ingredients until there is just a trace amount of the flour mixture visible. Fill each individual cupcake cup with brownie batter about 1/3 full. Place the cupcake pan in the refrigerator and chill for 3 hours. To assemble the Brooksters: After the cookie dough and brownie batter have chilled for 3 hours, preheat the oven to 350 degrees. Using an ice cream scoop, scoop out the dough into roughly 1 ½ tablespoon–size balls and use your hands to shape the dough into perfect balls. Gently flatten each ball into an oblong disk. The disks should be slightly smaller than the tops of the cupcake cups. Remove the cupcake pan containing the brownie batter and gently press a cookie dough disk into the batter in each cupcake cup. Place the cupcake pan in the oven and bake for 15 to 20 minutes, rotating the pan halfway through the baking time. The Brooksters are done when the cookie part is golden brown. Cool to room temperature or serve warm with ice cream. Oh wow! Brownies and cookies together? Must try! oh my, glad I finished lunch before seeing these - looks delish! Hi Shana, thanks for stopping by and pinning! Our websites have such similar names- I just had to stop by :) I have all 3 of the Baked books- definitely turned down the corner of this recipe to try later! Oh wow, I guess we do have similar names :) I'm glad to hear you enjoy the Baked bakery cookbooks. Thanks for stopping by Meghan. I need to try these! With brownies and cookies in the same place, how can you go wrong? Lisa, I agree, the combination of brownie and chocolate chip cookies is perfect. You're welcome! You will love them. I would definitely have to step up working out if I made these! Cookies and brownies are things I just can't resist. Pinned! I may have had to run a few extra miles this week, but they are worth it! I know, I am surprised I don't see them more often. 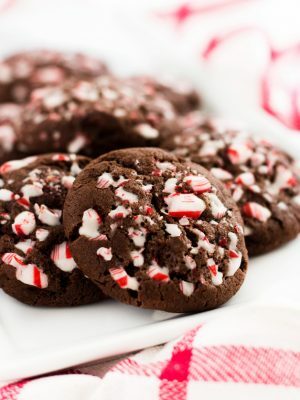 They are the perfect treat.